A Paper of Pins is a traditional song orchestrated by Ken Darby in 1956 and recorded by The Four Lads on July 17 in that same year. 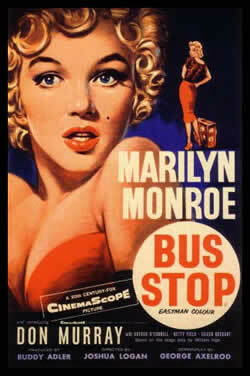 It was played during the credits of the movie "Bus Stop" starring Marilyn Monroe and Don Murray... often referred to as 'The Bus Stop Song'. Performance by Marty Robbins: Born Martin David Robinson on the 26th September, 1925 in Glendale, Arizona, US. He died December 8th, 1982 (aged 57) in Nashville, Tennessee, US. He was a musician, songwriter, actor and NASCAR driver whose instruments included guitar, piano, dobro and vocals. He performed from 1948 – 1982, and his music styles included country, western, gospel, pop, rock & roll and rockabilly... more. Tempo: 136 bpm (♩) or 68 bpm ( ) If you are using a metronome or similar device, you can set it at 136 bpm to play on every beat of the 4/4 bar, or set it at 68 bpm to play on every 2nd beat of the bar. It can sound a little busy at 136 bpm, therefore the optional timing can come in handy, and perhaps easier to play along with... the choice is yours. The fermata or pause symbol in this song, means you strum the chord, and stop. I used the version by Marty Robbins because it features the guitar and you can play along with the song very easily. The original version by the Four Lads is a more orchestrated version which is a little harder to play along with, but I have included it below if you want to listen to it. If you play along with the version by The Four Lads, it is also in the key of F major, except there are a few key changes in the Instrumental section in the middle of the song. It comprises of the first verse x 2. The first key change drops a semitone to E Major and back to F Major for the second half of the instrumental section. Also verses 3 & 4 are slightly shorter. You will need to remove the first half of each 3rd line in verses 3 and 4. You will notice this if you play along... hope this is not too confusing. Renamed: A Paper of Pins - 1930's by Alan Lomax. Best Known Recording: The Four Lads - July 17, 1956. The Four Lads are a male singing quartet from Canada that enjoyed major success in the 1950s. It was during this time that they were recruited by Mitch Miller to do back-up singing for some of his recording artists. One of these artists was Johnnie Ray who became a major star in 1951 with Cry and The Little White Cloud That Cried . With increased popularity, The Four Lads went on to record their own songs. In 1952, they had their first hit single with the song, The Mocking Bird . In 1953, they had their first gold record Istanbul , and went on to establish themselves as major artists. Two of their most famous hits were Moments to Remember recorded in 1955 followed by Standin' on the Corner . Past Members: Corrado "Connie" Codarini (deceased), John Bernard "Bernie" Toorish, James F. "Jimmy" Arnold (deceased), Sid Edwards, Johnny D'Arc (deceased). MARTY ROBBINS chords and lyrics are property and copyright of their owners. "A Paper Of Pins" chords and lyrics are provided for educational purposes and personal use only.